Yesterday, when she first woke up, my teenage daughter Enani asked, "If Donald Trump gets elected president, will I be sent back to Africa?" Enani was born in Ethiopia and, through international adoption, became our daughter when she was two years old. I posted Enani's comments to Facebook, and right away I knew I'd struck a nerve. Other parents began to chime in: it seems Enani expressed a fear that many children born outside the U.S. -- particularly internationally adopted children of color -- are feeling. In the few months since Donald Trump announced his candidacy, immigrants who once felt relatively safe in their new country -- a country that used to take pride in its status as a "melting pot" and a "nation of immigrants" -- have seen that there is a very ugly white underbelly of America that doesn't want them here. Trump supporters are making clear that even citizenship means little to them when it comes to Muslims and people of color. My husband and I (who are white) thought we were prepared for the hurdles our adopted daughter would face. We were educated, we had read so many books, we had gone to talks, attended classes and discussions. We believed that we could help our Ethiopian child navigate the stresses of racism in the U.S. and grow up to be a strong African American woman. It never occurred to us that, seven years into the term of America's first nonwhite president -- and nearly 12 years into our life with her -- she would have to contemplate the threat of being "sent back to where she came from." I don't mean to imply that a President Trump could "make good" on every ugly specter that he's raised. But the first, most basic duty of parenthood is to keep your child safe, a duty that includes making them feel safe, too. Suddenly, thanks to the Trump campaign, my husband and I find ourselves failing at this second part. Our daughter feels acutely just how many of her fellow citizens do not want her here. 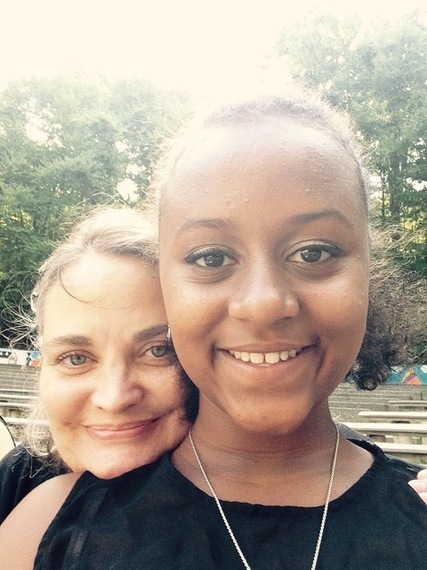 It's a tremendously scary feeling for a 14-year-old -- not least because the United States is, in fact, her only country; she had to give up Ethiopian citizenship to become a U.S. citizen. When she was adopted, she lost her country, her first language, her culture, everything she had ever known. She was flown 8000 miles to live with total strangers. Still, we made the choice to adopt because we believed we could make a wonderful life for her here. America is the land of opportunity, right? The greatest country in the world, right? I don't know. When I see images from Donald Trump rallies, I don't recognize my country anymore. I don't recognize the country we brought our child to grow up in. Losing both parents is an almost unimaginable trauma. Being internationally adopted is a trauma. Being interracially adopted is a trauma. Our daughter has suffered so much loss in her life. We believed that with love and nurturing and support, we could help Enani cope with her terrible early losses. But, even here, even with parents who love her more than anything, even living in a mostly black community, she knows that a frightening number of her fellow American citizens would like to see her gone. Enani is no fool. She's smart and funny and beautiful. We want everything good for her. But, we cannot protect her from the racism and hatred that seem to be increasing daily. We can't protect her from the truth. I tell Enani that she is a U.S. citizen, that she is safe. She IS a U.S. citizen, but will that really keep her safe? On February 29th, 30 black students were thrown out of a Trump rally in Georgia. On March 1st, a young black woman was attacked -- grabbed, pushed, shoved, and assaulted with racist slurs at a Trump rally in Kentucky. Of course, on March 5th, in Florida, Trump asked his supporters to raise their right hands to pledge to vote him, resulting in a scene that was a throwback to Nazi Germany. Trump seems to relish and encourage the bloodlust, and I, like many others, think it's only a matter of time before someone is killed at one of his rallies. Donald Trump has verbally attacked people with disabilities, soldiers who were POWs, "the blacks," immigrants, Mexicans, women. . . . It's clear that the only people he sees as worthy of respect are native-born whites -- plus, of course, the (white) Eastern Europeans he imports to work for (or marry) him. Of course, for now, his worst excesses are saved for America's Muslim population. He talks about monitoring mosques -- spying on Muslims in their own houses of worship. He has proposed forcing Muslims to register in a national database. He's gone so far as to suggest that Muslims should have to carry identification cards so they can be more easily recognized by police and other authorities. But every American who believes this "special treatment" could or would be limited to Muslims has not thought very hard about the matter or studied much of history. Trump says he loves "the poorly educated." The poorly educated are less likely to understand the string of choices that led to Germany's murderous rampage, not only against Jews, but Romani people, gays and lesbians, the mentally and physically disabled, Socialists, political dissidents, and many others.